Life in Color returns to Miami to paint the city neon for Martin Luther King Jr. weekend 2018. The yearly spectacle is hosting their 11th edition of “The World’s Largest Paint Party” in the beautiful art district of Miami, Wynwood. The grounds of the Mana Convention center will play host for the one-day sensory spectacular music festival. When you think of Miami you think of warm weather, beautiful people, amazing electronic music and the most colorful art you can imagine. Heck, a portion of South Beach is coined as an actual U.S. historic district: The Miami Art Deco District. Think of this event as a homecoming. 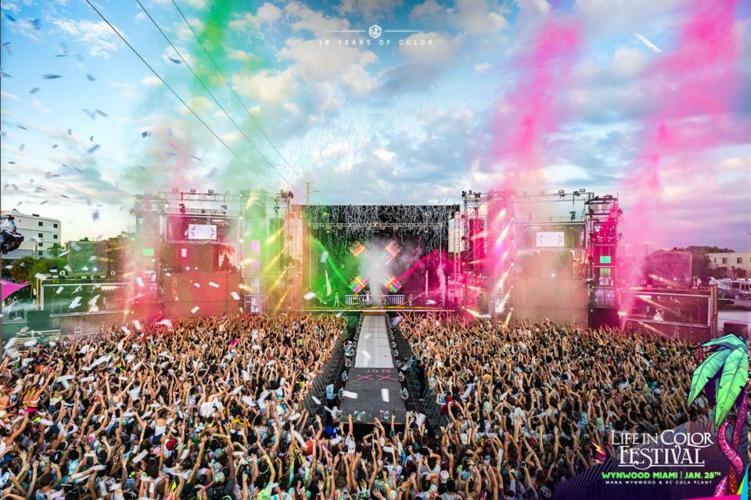 Enter for a chance to win two tickets to life in color Miami courtesy of river beats! Winners announced Thursday, January 11. Entry details can be found here. Just like, share & tag your friends for a chance to win! Blnk Cnvs (previously known as Committee Ent.) has been throwing paint parties in clubs, parking lots, convention centers and arenas for the past 10 years now. Starting in Miami in 2007 the company threw one of the first “DayGlow” paint parties in a club called Allure with only 600 in attendance. CEO Sebastian Solano describes LIC “almost like a Broadway show, but with such an energized crowd you would need to see it to believe it.” There are aerialists, flow artists, interactive art installations, food trucks, amazing music and gallons of neon-colored paint. LIC Miami has ZEDD, 21 Savage, Snails, blackbear, K?D, Lil Pump, Parker and Quix headlining this year. These huge names in EDM will play the hottest tunes and will be the soundtrack to the first musical event of the year in Florida. The diverse lineup will take everyone on a journey through art and EDM. Synchronized paint blasts and confetti cannons will make every single attendee a part of the painting. Everyone is encouraged to dress in white so they can leave a painted masterpiece. The event will be held on January 14th from 4 PM to 12 AM and is 16+. Tickets start at $74.99 and are on sale now.